I know there’s been a gap in my blog posts but I’ve had my hands full with a special delivery that arrived just after Christmas. No, not the huge Sideshow Collectibles Batman statue (although Scifi hubby is almost as excited about that) but the arrival of Scifi baby. Which parcel was Scifi hubby more excited about I wonder?! 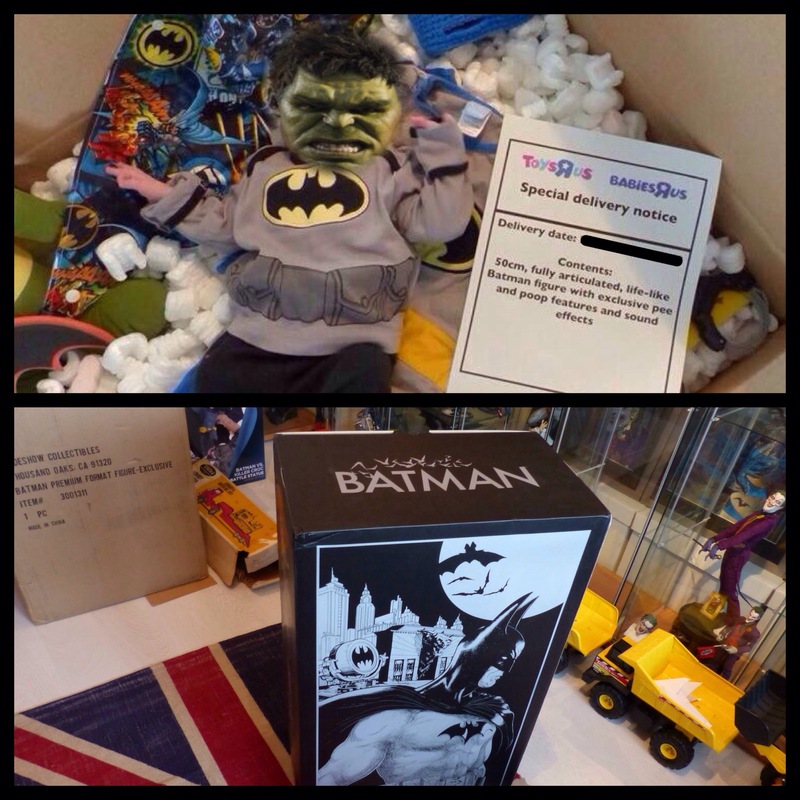 Scifi baby (top – yes that really is Scifi baby in the box) or Sideshow Collectibles PF Batman statue (bottom) – in case you can’t tell them apart. I know you all want cute baby photos and I’ve ruined it by putting Hulk’s head on Scifi baby but like all photos on this blog he is staying in disguise 🙂 We have had a long debate over which character he should be and finally decided that Hulk was the most appropriate. Hopefully he will be as intelligent as Dr Bruce Banner and he is certainly calm and lovely most of the time. However when he “goes Gremlin” it is like watching Dr Banner transform into the Hulk and go raging. Even Betty Ross would struggle to calm him. Of course all the usual baby platitudes apply: he’s gorgeous, mother and baby are both doing well etc etc. However as a Scifi baby there are a whole other set of references that are being rolled out. Most babies look like Winston Churchill – Scifi baby looks like Yoda. Most babies cry/scream – Scifi baby “goes gremlin” but still needs feeding after midnight. Most parents pretend to eat their baby’s fingers and toes – Jaws is involved in the Scifi household. Most babies have a cute blanket in their car seat – Scifi baby has a Batman cowl/cape blanket. Most babies have pastel bedrooms and bedding – Scifi baby has Batman bedding in his cot and Avengers in his Moses basket. Most babies like nursery rhymes and soft classical music – Scifi baby goes quiet to the opening score of Star Wars A New Hope.